...Even so, it’s still the one I would most like to own, because it’s such fun on circuit. It’s that time of year again: lock away your bank cards and bury your smartphone in the garden, because we’re going to decide this year’s most cost-effective route to performance thrills, handling poise and driver engagement. Last year the not-for-wallflowers Honda Civic Type R topped an order full of full-fat, full-sized hot hatchbacks that included the Mercedes-AMG A45, Volkswagen Golf R, Ford Focus RS and Audi RS3 Sportback, in doing so proving that you don’t need to spend Porsche Cayman levels of cash in order to get the best of this particular breed. But this year we’re sliding our definition of ‘affordable’ downwards in a direction which should please your mortgage advisor. This year’s flurry of new, downsized pocket rockets, ranging from the £14k VW Up GTI to the £27k Toyota Yaris GRMN, means we’re stacking the deck with particularly cheap and exceptionally cheerful front-driven hot hatchback options. Moreover, the priciest car we’ll tempt you with is the £29k Renault Mégane RS 280 Cup, the heir of a car that’s won our annual Britain’s Best Affordable Driver’s Car (let’s call it BBADC) shootout before. We need four from the eight, that’s the idea. There’s a fifty-fifty chance of getting through to the knockout phase, then, and, as was said quite a lot earlier this summer, once you’re there, there’s every chance, right? At the end of the day, Clive, on the night, with a little bit of luck, it could go your way. Isn’t it, eh? So consider this to be the important group stage, over two legs, on road and track. It’s the important reckoning where the obvious duffers are sent home while those with potential leap, or scrabble, through. Only here there aren’t any duffers. Each year I’m slightly surprised by this, but for ‘junior handling day’ we manage to assemble as close as we can to 10 cars that are, at least in part, new since last year and which come at a tantalisingly approachable price. And we have at least as much fun as we do at our money-no-object Britain’s Best Driver’s Car contest each autumn. The winner of this gets through to that contest, too – but given the fun we have over these three days of kerb-bashing, chase video-making, road-driving, lift-off-oversteering, over-hyphenated entertainment, maybe it should be the other way around. 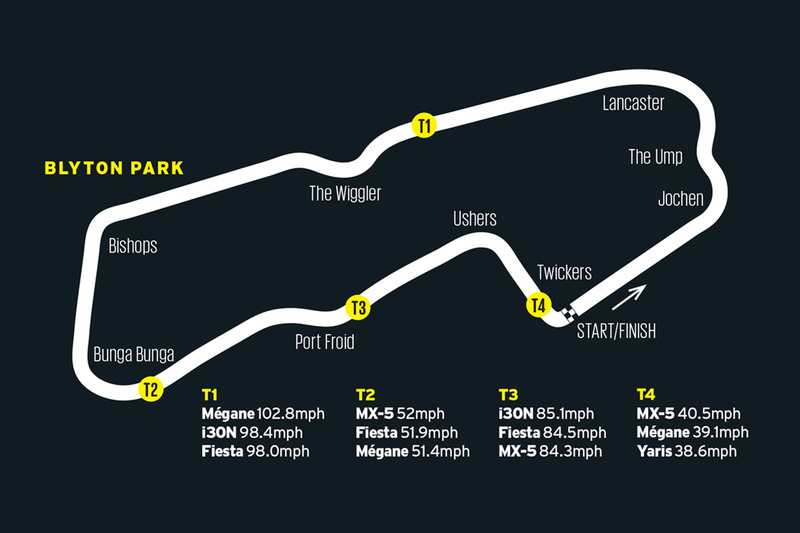 At Blyton Park and on the way to, from and around the Pennines, we have a tremendous giggle. And yet... no brakes are fried, no tyres are destroyed, no support teams are required, no width restrictors are threatened and nobody calls us an irresponsible bunch of <redacted>. Whisper it, but these are the true driver’s cars for the days in which we live. Only one of the eight – I wish there were more, but such is life making fun cars on restricted budgets – follows the preferred convention of a longitudinally front-mounted engine and correct-wheel drive. It’s the recent tweaks by tuner BBR that not only make the Mazda MX-5 eligible this year but also make it likely that this version can compete at the pointier end of the competition. I drive it from BBR’s Brackley HQ, next door to the Mercedes F1 team, and can tell almost immediately what sets this car apart from a regular MX-5. It isn’t just the extra power, although at 210bhp there’s plenty.It’s mostly smoothly delivered, too, except for a minor sticky spot at 2000rpm, where you rarely sit. No, it’s BBR’s chassis kit that makes a bigger difference. Better dampers improve the body control, removing much of the tip-toeing feel that undermines the demeanour of the standard car, which has a wickedly fast roll rate and initial turn. You still feel like you’re sitting on top, rather than inside, this MX-5, and the steering is a touch quick off the straight-ahead, but you can place it much more confidently thanks to improved roll stability. On Michelin Pilot Sports, though, it has tyres that are perhaps still too good for the chassis and which rob it of some on-the-limit adjustability. On the road they improve steering accuracy, but if you’re looking for track fun, despite a tiny kerb weight and nearly 200lb ft, this is a precise and remarkably unlairy drive. That is not a criticism you’d put towards the Toyota Yaris GRMN. My favourite line about this car comes from m’colleague Saunders’ first drive of it, likening it to the gag about stopping to ask for directions: ‘If that’s where I was headed, I wouldn’t have started from here’. But where Toyota has ended up in a rather wonderful place with this rather unlikely supermini. People don’t make cars like this any more and I’m not sure Toyota ever did. It’s daft, in excellent ways. Not many of our testers thought much about the way it looks, nor its £26,295 price, but such is the cost of having a supercharged, Lotus-tuned 1.8-litre engine rather than something from the rest of the product line up, I suppose. Besides, the price matters only for getting into this test. On the road prowess counts for a bit but on the track far more than that. The Yaris is more entertaining than plenty of cars costing twice as much. 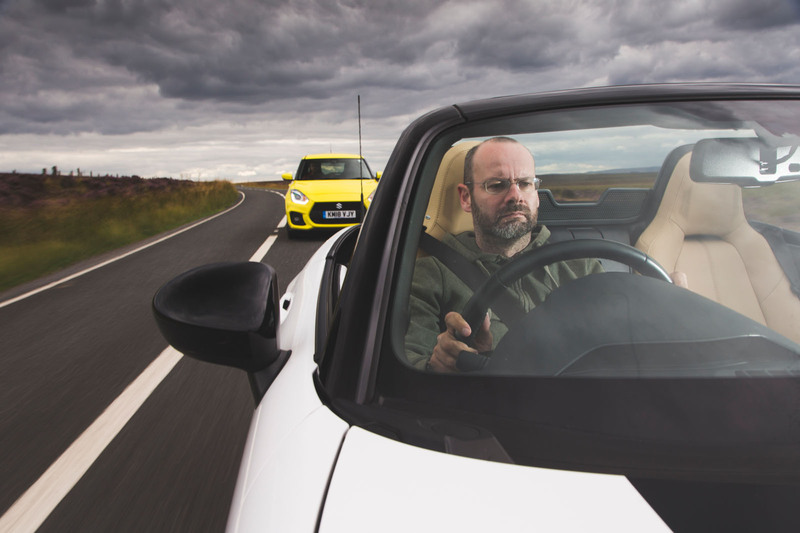 It’s infectiously raw, with the chassis tune given over almost entirely to body control rather than ride comfort, which a couple of testers thought was a bit much for the road. But there’s terrific agility, too, albeit ultimately less lift-off adjustability than some of the cars here enjoy. But we loved it. And if ‘GRMN’ is too obscure, think of this as a Yaris GT3. “I’d want a more competent car for £26,000,” reckoned Saunders. “But I don’t think you could ask for a much more involving one.” Agreed. 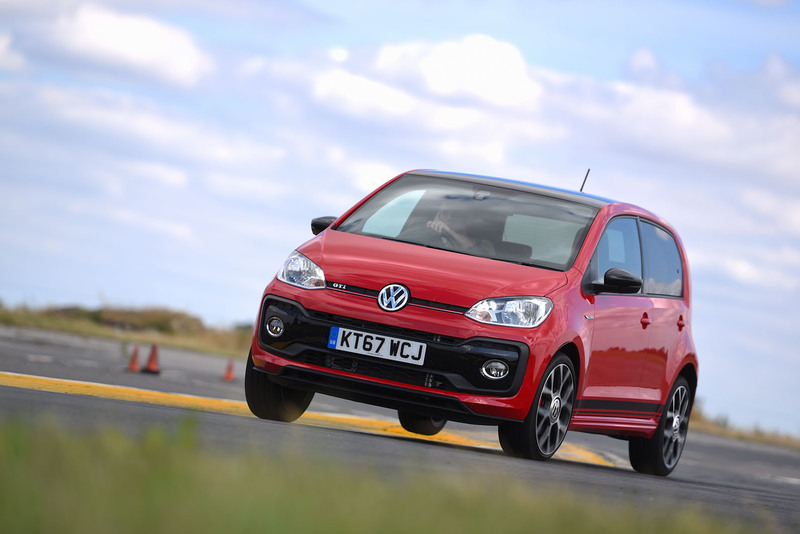 We’d expected similarly fine things from the Volkswagen Up GTI, the cheeky, light city car from Wolfsburg finally untamed. But the thing about VW is that such is the consistency it retains between models, even when one is allowed to let its hair down, its locks still barely brush its shoulders. The Up is an enjoyable car. Not just in isolation but in company, too. As the smallest car in the contest (if not quite the lightest) it always had physics on its side: it doesn’t weigh very much so it doesn’t take much stirring to make progress. The thrummy three-pot engine, albeit a bit laggy, sounds good, and there’s an agreeable mix of body control and ride comfort. Except it’s just slightly too agreeable, too Volkswageny. This is a little warm hatch you can drive every day, but if you’re looking, as we are, for enjoyment, this car errs too far towards the sensible. As one tester put it: “Affordability got it into this test but the driving experience means it can’t place anywhere but last in my book”. He’s got a slightly different book to me, but I take the point. It’s not a disappointment, though. This test isn’t about that; it’s about being perennially surprised by the quality of the entrants. Case in point? The Suzuki Swift Sport. From the moment the first tester climbed aboard until the last one got out we heard the same thing: “I really like it.” But not quite enough. The notes say things like ‘The controls don’t lure you in like the last one’s did’, ‘The handling is a touch softer’ and ‘It has more power but less star quality’. The Swift Sport, then, has grown up a bit. You can tell as soon as you sit inside: there’s an excess of head room and the whole demeanour is far more mature than it was. But fun can be wrung out of it, particularly on the road. Body control is really good, exceptionally composed, in fact. In some of the cars here, you approach, say, a cattle grid and know you’re in for a bitof a grilling (sorry); in the Swift there’s absorbance of the bumps but a surprising surfeit of float on the way in or out. It’s impressive, and fun in its own right, but this relative compliance doesn’t do it too many favours on a circuit, where it errs into blandness. It’s good – better than good, actually – but here it’s up against some serious competition. Such as the Hyundai i30N. This version is shorn of the Performance Pack that put off quite a lot of testers (although not me) at our main Britain’s Best Driver’s Car contest last year. Here, then, without a limited-slip differential, with a bit less power and with more compliant springs, the i30N is finally the car that makes other testers come around to my way of thinking. I genuinely think this is the best mid-sized hot hatch you can buy. And, hey, it has 247bhp and does 0-62mph in 6.4sec. Honestly, how fast do you want to go? Perhaps. But it’s the honesty of it, the straight forwardness of it, that I rate the most. It’s an old-school but not old-fashioned (yes, I nicked that from the creator of the Porsche Cayman GT4) kind of hot hatchback. Its steering is accurate and has the right levels of torque build-up and weight. On a circuit it can be banged over kerbs and it wants to rotate around its middle in the way that a great hot Ford can – only I don’t think the most recent Focus ST did it this well. A real star, this car, I think. Granted, the Hyundai doesn’t turn around its middle in quite the same fashion as a Ford Fiesta ST. But then the i30N rides better. The Fiesta has better body control. But the i30N has a better driving position. The Fiesta steers so quickly, intuitively, so enthusiastically... I could go on. Clearly it doesn’t take long in the company of these two to realise you’re edging towards the upper echelons of hot hatch quality, as usually tends to be the case with an ST-badged Ford. Is the Fiesta’s ride still a bit much for the road? According to a few of us (me included), it is. But the Fiesta ST has an infectious, bubbling enthusiasm for getting around corners in ridiculously agile fashion. Maybe the engine is a bit dull, and yes, the driving position is a bit high. And, yes again, sometimes that flippin’ ride quality is an issue. But a few corners is all it takes to forgive it. That’s a harder thing to do with the Mini Cooper S. If there’s a lesson to let your hot hatches be hot, this latest Cooper S represents it. On the road the Cooper S is a relatively swift, well-finished and attractive everyday proposition. As one tester harshly put it: “Cooper S has become something of a trim level over the past decade, the true performance ingredients being saved for even pricier derivatives”. 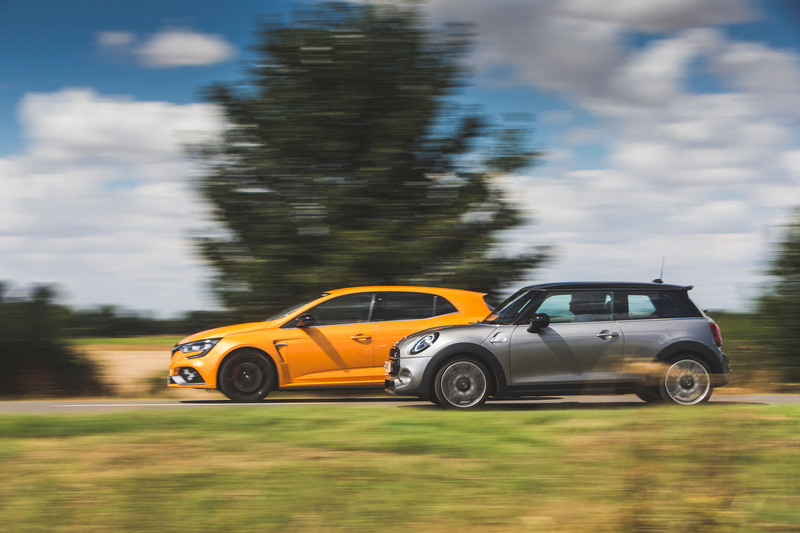 That might, unfortunately, be true: it takes a JCW badge for the Cooper S to come alive. Which is a shame, because the basics are all there: it looks good and it feels good, but where there ought to be poise and agility you get flop and sag. The Up GTI came last in a couple of testers’ books but the Mini was last in mine. The Up makes quite a lot out of what it has; the Mini feels like it’s holding something back. 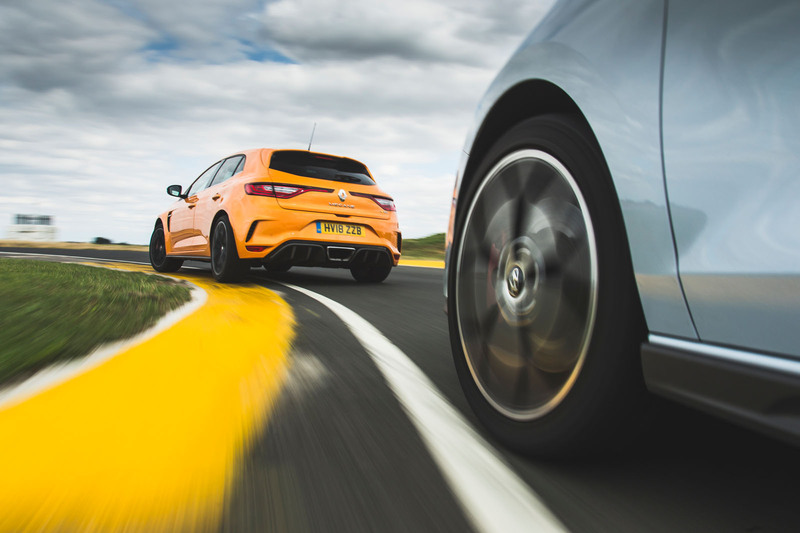 Which brings us, finally, to a manufacturer, and indeed a model name, that has in the past trounced all other comers in this shootout: the Renault Mégane RS. But what about on a circuit? “Wow, what a track car,” was his verdict. Quite. Whatever Renault has done here, it has lost some of the delicacy that was the hallmark of RS Méganes and Clios of old. Consider what happened to the Clio between the previous generation and this one: the same, to my eyes, has happened to the Mégane. It’s still adjustable to the point of hilarity and fast to the point of daft, but some nuance and delicacy has gone – and that’s a shame. All of which means the Renault wasn’t a clean sweep for qualification. Five testers, four nominations apiece and the Mégane only convinces three of us: Lane, Saunders and Prosser. Bird, of team Pistonheads, and I both nominate the Yaris in its place, for its infectious charm. So the Mégane only swings it by a single nod. I’m not saying that’s wrong, I’m just saying Bird and I are right. 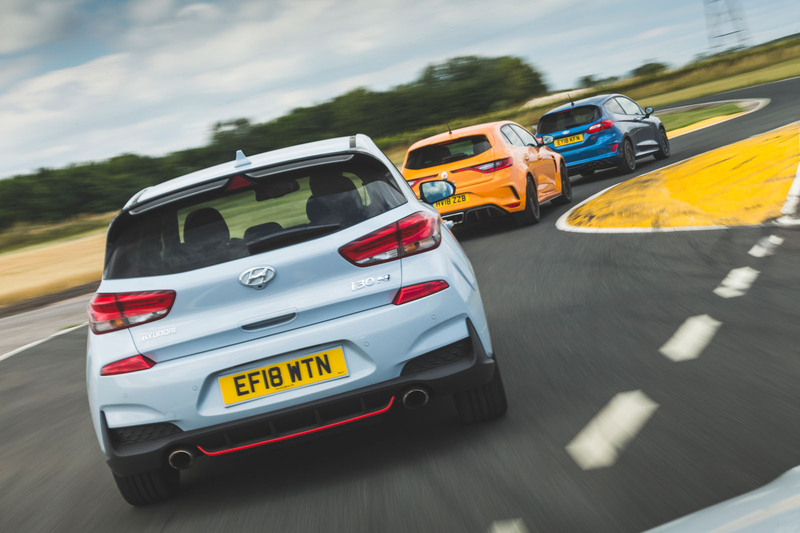 Anyway, other than that, every car that gets through is one to which we all give our wholehearted backing: the Ford Fiesta, the BBR MX-5 and, praise be, the Hyundai i30N. How’s that for consistency? No other car gets a look-in. We don’t award overall credit for lap times in this contest because, as cars such as the Morgan 3 Wheeler and Toyota GT86 have so plainly illustrated in the past, driving fun often has little to do with outright pace. Had we taken lap times into account, however, the Mégane would have climbed the order. The Renault’s time illustrates what’s evident when you drive it at track pace: that it has big-car performance, outright grip and circuit purpose to burn. 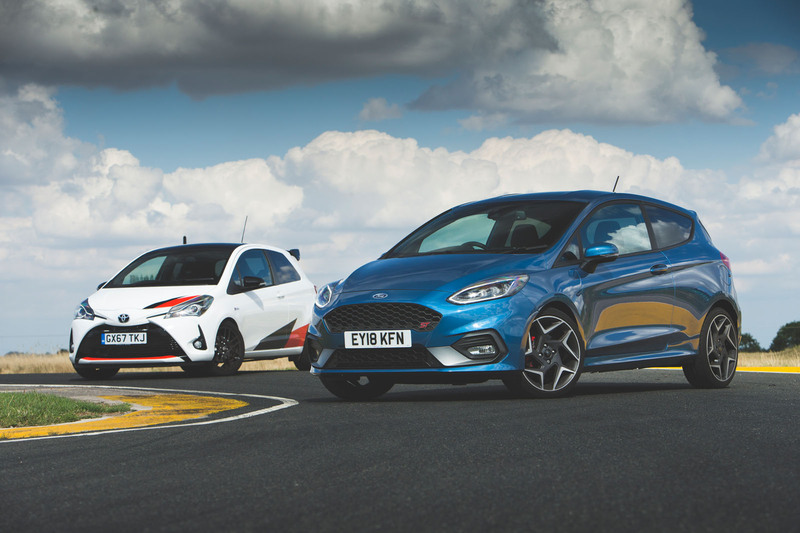 The fight for the remaining lap time podium places was incredibly close, however, and while the Fiesta ST lost out so narrowly, its pace proved conclusively that if you want to go fast on a budget, you needn’t look anywhere else. 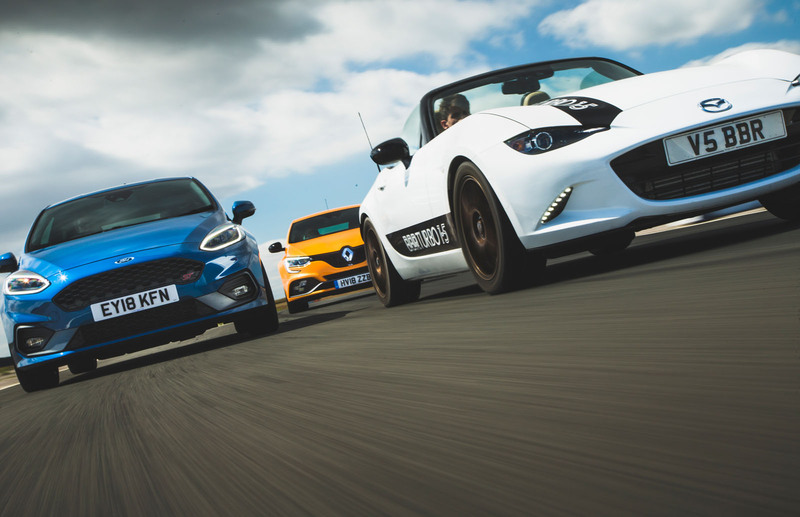 The BBR MX-5’s Michelin Pilot Sport Cup 2 tyres certainly helped it to a time that the outright performance of its 210bhp engine couldn’t have hit had it been on lesser tyres. 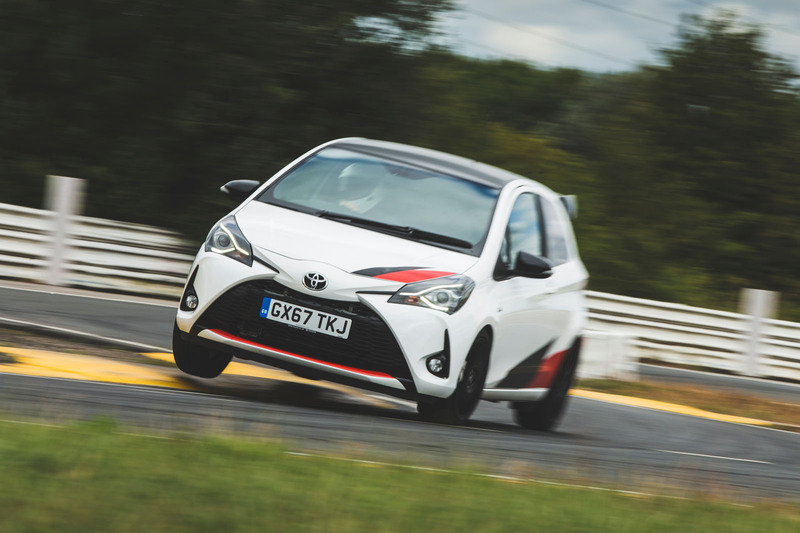 The Yaris’s time, conversely, demonstrated the cost of under-speccing the rubber on your affordable performance car. 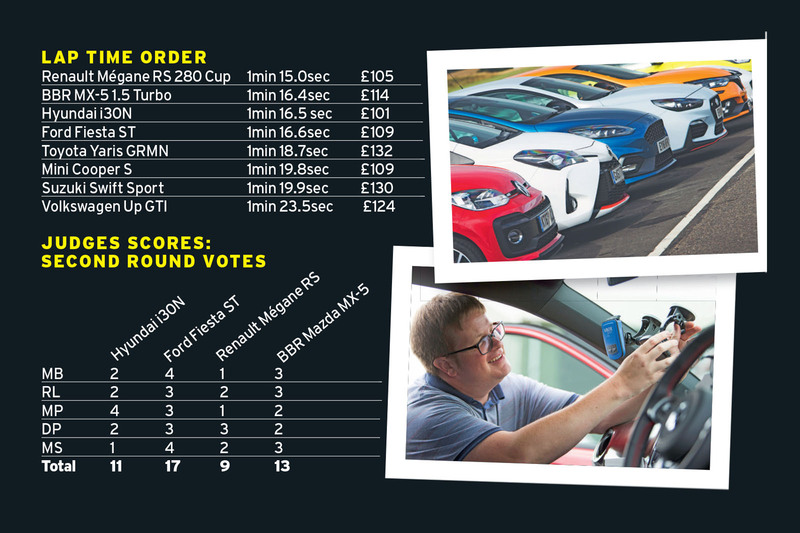 If getting the biggest bang for your buck matters above all else, the Hyundai i30N asks the least for each of its imperial brake horsepower (£101), narrowly beating the Rénault Megane RS 280 (£105). The priciest thoroughbred horses in the field, meanwhile, at £132 each, were stabled in a place that few would struggle to guess: under the bonnet of the Toyota Yaris GRMN. HONDA CIVIC TYPE R 2017 - The Civic Type R’s wild looks certainly haven’t escaped the attention of the second-hand market: prices for year-old cars are roughly on a par with those of the Volkswagen Golf R, despite the Honda costing £2000 less when it was new. Expect to pay upwards of £27,000 for a clean example being sold privately. FORD FIESTA ST 200 2016 - The Fiesta ST is another car that’s always held its value well — in stark contrast to the cooking model on which it’s based, which is cheap as chips as a used buy. 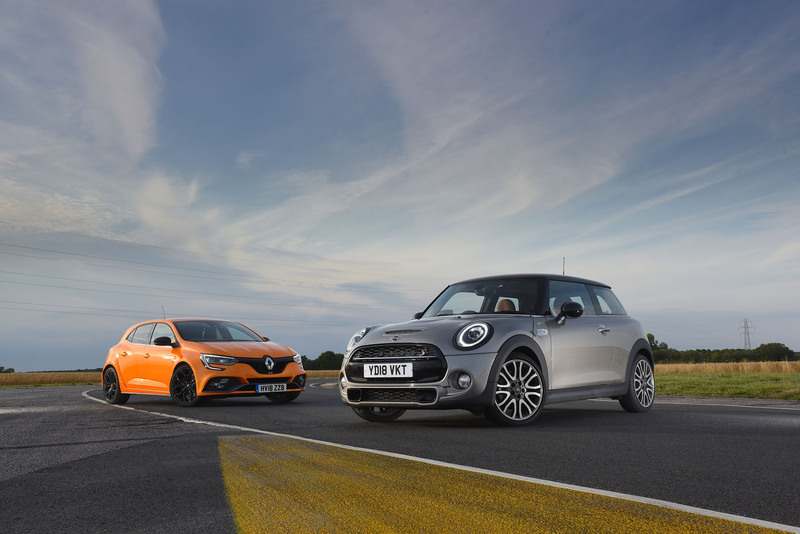 That’s especially true of the run-out ST200, which will still cost you £17,000 from a dealer. Too steep? Then pay £8500 for an early standard ST, our 2013 BBADC winner. MAZDA MX-5 2.0 2015 - Mazda MX-5 values, on the other hand, have always tumbled pretty fast, and happily for the used buyer (if not the owners who bought new), that remains true of the latest ‘ND’ version. Around £15,000 should now be enough to get you comfortably ensconced in a tidy early 2.0 example, in the excellent Sport trim, from a main dealer. 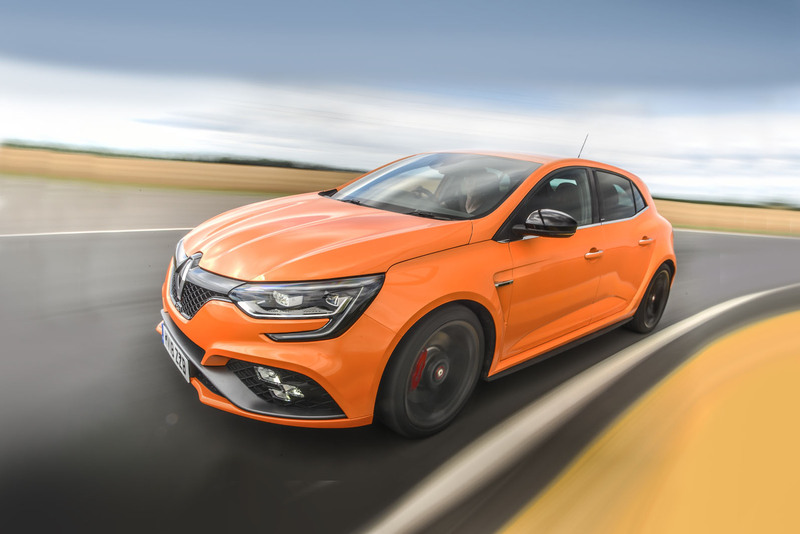 RENAULT MEGANE RS 265 2014 - Renault sport Méganes are starting to look cheap now — especially given their incredible ability. Watch out for the slightly fragile interiors and watch for electrical niggles. Just £14,000 gets you into a 2014 facelift example from a franchise, or pay less than £10,000 for an early pre-facelift. I know it only has 99bhp, but I can't find any car pubication or website that has road tested the 1.0 T-GDi Kia Picanto GT-Line yet. That car seems like a much closer match to the VW Up GTi than the much more expensive Suzuki Swift Sport that the Up GTi is always compared to. Swift is very nearly as quick round the circuit as the Mini Cooper S and leaves the Up GTi in it's wake, the Picanto would be out of it's depth. Feels like the the right cars have moved on to the final four. Hiunday in particular really seem to have nailed with the i30N. It's just a shame that it looks a bit meh ( that profile ), but the Fastback will be getting this same spec in the coming months, and that one looks great. Found it strange that the Yaris made it to the list. Not that it isn't a nice car ( it pretty much got great reviews everywhere ), but it's been sold out for months, and they only made 2500 ( ? ) of them anyway, so good luck finding one. And i'm sorry, but the Cooper S does not look good. The car itself is no beauty, and the S bodykit makes it even worse.